The warm water, palm trees and crystal-white sand of the Santa Maria beach were everything I pictured when I used to think of Cuba, a picturesque island in the Caribbean. However, over the past four days, my rosy tourist perspective has disintegrated as my eyes increasingly open to the real Cuba, a very different picture than travel agencies sell to Americans. The beaches do glitter with the promised tropical, soft white sand, but they’re also littered with garbage. Beer and soda cans bob on the balmy waves and children play with glass bottles like toy boats in the surf. Candy wrappers and diapers poke out of the sand and I worry more about stepping on broken glass than sea life. While garbage may seem to be a side effect of such a populated destination point as the beach, the ocean isn’t the only thing impacted by Cuban waste. Litter lines the concrete Malecon, the seawall that separates the city from the ocean, and in rural towns outside the city of Havana, trash propagates almost abundantly as vegetation. Potholes on the sidewalks of the city function like makeshift garbage receptacles and soda cans cap the ends of tree branches that shade the sidewalks. As progressive as Cubans are in some aspects, when it comes to their waste, they lack in environmental consciousness. It seems like their actions are in response to their poor living conditions, void of luxury and personal autonomy; most of their day-to-day lives are controlled by the state. Government rations are sparse and Cubans can’t own their own property. They are paid around 30 CUC per month, equivalent to $30 in the U.S.
Today in Old Havana, I dropped 1 CUC on the ground and had to step on it to stop three different kids from taking it, they swooped down so quickly. 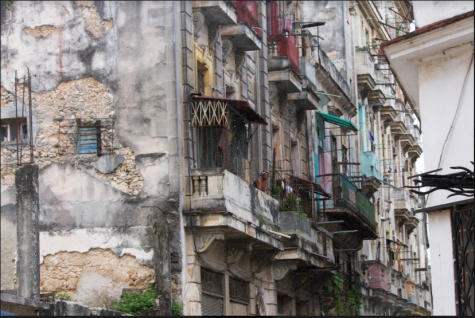 Our tour guide confirmed that in Havana, entire families live in crumbling, dilapidated buildings that once belonged to Cuba’s elite, who vacated during the revolution. 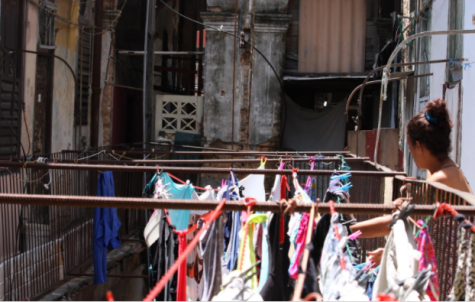 They are passed down from generation to generation and would be deemed uninhabitable in the U.S.
Cuba is impoverished, but poverty does not guarantee squalor. I believe that Cuban’s attitude toward managing their waste speaks volumes about the way they view themselves, their culture and their leaders. Perhaps they are simply uninformed about things like carbon footprints; however, I believe that their lackadaisical attitude regarding waste is intentional. In a communist country where food is rationed and property is owned by the government, blatantly not adhering to minimal state policies could be interpreted as a subtle act of defiance, a way to regain control of their autonomy. In America we have litter and landfills—entire islands of floating trash—however, I believe U.S. waste is largely due to a mixture of carelessness, privilege and luxury. With a system of capitalism, we have too many goods and a disposable “if you break it, buy a new one” mentality. 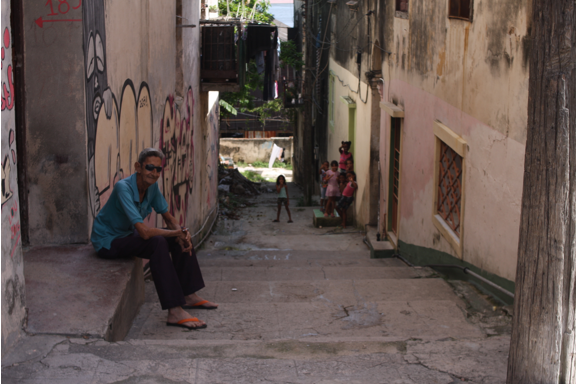 In Cuba, their waste disposal hints at an undercurrent of repression and poverty. While Cuba is advertised as a tourist’s paradise, the residents of the city know a different Cuba. 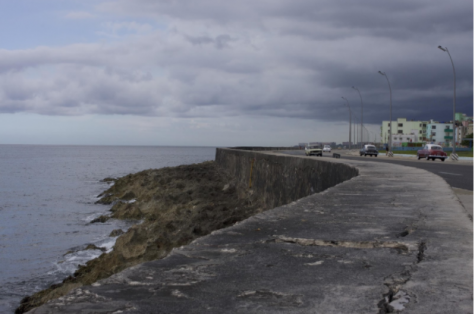 A paradox exists, symbolically portrayed by Cuba’s picturesque beaches, marred by the ugly aftermath of gluttony and ignorance. 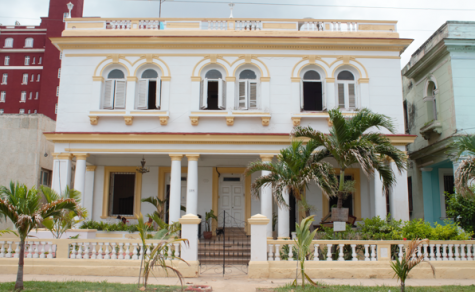 Cuba debatably progressed in numerous ways under Fidel Castro; however, there are many things about the lifestyle that make visitors like myself, who are used to a more luxurious lifestyle, uncomfortable. 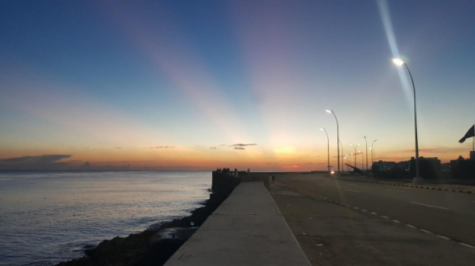 When we finally realize that the true Cuba doesn’t quite stack up to the Cuba of our dreams, we can simply leave and choose not to see the ugly truth lurking just below the surface. But Cubans will wake up tomorrow and the candy wrappers, used condoms and beer bottles will still be there. And they will keep adding and adding to the piles because nobody’s organizing any beach cleanups anytime soon. 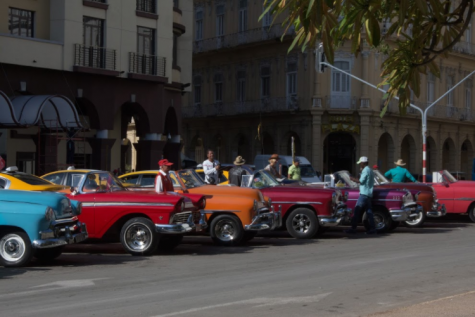 Visiting Cuba is like stepping back into the 1950s. This realization first hit me as strong as the humidity at the Jose Marti airport, where we disembarked from the plane onto a tarmac instead of a terminal. The men and women employees wore traditional gray uniforms: the men in suits and the women in pencil skirts, white blouses and low heels. Stranger yet was the fishnet tights and blue eye shadow sported by several of the younger women. The fishnets stockings, which have promiscuous connotations in the states, stood out in stark contrast to the traditional shapeless skirts and modest blouses. Because of this, my first impressions were that Cuban women were a confident, rebellious bunch. However, the more I explored Havana and surrounding towns, the more I realized that while the fishnets themselves appear to be a nonconformist choice of self-expression, they are still acceptable within certain parameters. Fishnets hugged the thighs of museum curators and grocery store stockers alike and led me to question whether they’re an act of defiance, as I first assumed, or just another sexist accessory of traditional conformity. Under Fidel Castro, the number of literate, educated, working women increased exponentially, earning him a reputation as a feminist. Cuba is perceived as a progressive country for women’s rights and equality; however, there’s a dark side to the women’s experience in Cuba. For example, domestic violence is allegedly an under-addressed issue in Cuba. It was the fishnets that first piqued my interest and led me to question what life is like for Cuban women and what challenges they face every day. I want to learn more about what feminism looks like in Cuba and if the government paints a rosy picture of progress. 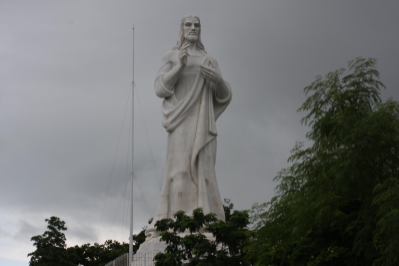 During a talk with our translator Mario, I learned that the “Cristo de La Habana,” the large white Jesus statue overlooking the Habana pier, was commissioned by Batista’s wife and built by a woman. Mario told us that there’s an ongoing joke amongst Cubans that the statue was made out of wood because the last name of its builder was Wood. Women play a major integral role in every society; however, too often their voices are silenced and forced to take a backseat to history as told by men. It is my intent to bring their stories and voices to life through my photos and in my article. You can tell a lot about a culture by observing how it ritualizes mealtimes. In America, convenience and efficiency are prioritized over the quality of both food and togetherness. 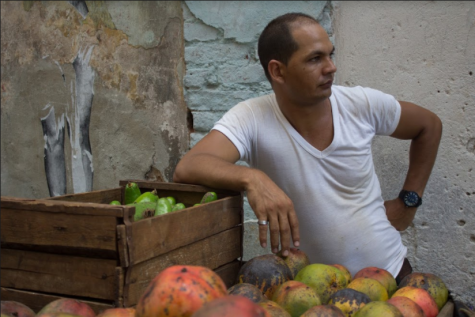 In Cuba, the process is much slower and more laborious. Drive-thru’s don’t exist and you’re forced to take a more active role in dining, which means either tracking down your own waiter or standing at a table or bar to eat because there aren’t enough chairs. Amongst these, there are some other unspoken rules I’ve discovered when eating out in Cuba. You have to have patience and don’t expect a quick trip in and out like in America. Mealtime is a bonding opportunity and a slow process. Hosts don’t incessantly check up on you and your food will take longer than expected to arrive. While servers are quicker to clear off empty plates and glasses than in the United States, you usually have to ask for the check. Due to rations and limited food supply, you might order a pizza and sandwich at a café one day and return the next to find them completely out of bread. Dishes at restaurants also change according to what’s available that day. For example, a few classmates ordered the same dish on two separate occasions and received a slightly different meal. The other day, I stood in line at a small, state-owned market down the street for 30 minutes to buy water, only to find out halfway through the line that they had none. I’ve been told over and over that in Cuba, you need a Plan B, C and D, because things don’t always work out how you expect them to, and I can verify that from experience. Mealtimes are about more than sustenance, they provide an opportunity to bond and spend time with one another. 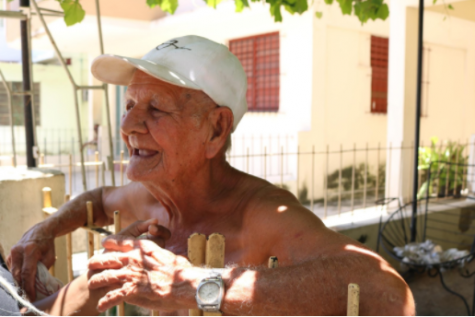 In Cuba, that sense of community and togetherness is much stronger than in America. Eating out in this country has taught me patience, humility and has encouraged me to both be assertive and to keep an open mind. My favorite monument in Havana lives in the courtyard of the Plaza Vieja. A voluptuous woman wielding a fork rides a giant rooster that stands poised on one leg. There’s no plaque and no explanation of the meaning behind the statue but it’s intriguing and strangely empowering. The woman is unabashedly naked except for her shoes and seems to have tamed the masculine chicken. It’s unique and also symbolic of the progress that women have made toward equal rights in Cuba. In the workforce, women are doctors, engineers or small business owners. 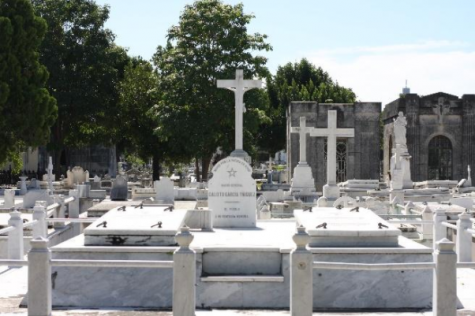 CENECEX and the FMC, two major organizations that were established and by Raul Castro’s wife Vilma and carried on by daughter Mariela, are devoted to preserving and enhancing this movement. My project in Cuba was women’s rights. I interviewed various women from various walks of life to get a sense of what life is like for women in Cuba and learned some interesting things. The leader of an all-women band told me that they have to work twice as hard as men to establish themselves in the music industry. They practice six days a week and play five; all of the women can play multiple instruments and sing well. A social psychologist-turned-nail salon owner switched to the beauty industry because she couldn’t find a job that paid well enough in her field. She employs one other girl and paints nails in the front room of her house. She charged me only 3 CUC’s or $3 to paint and file my nails. A professor of women’s studies at the University of Havana shared that there are limited organizations or resources to help women who are victims of domestic violence, which frequently occurs in Cuba. While organizations like the FMC and CENECEX supposedly devote themselves to women’s rights, the interests of the revolution come first. In theory, this was all very fascinating for my project, yet it wasn’t until the last night of my trip that I witnessed firsthand what life is like for many women in Cuba. Two of my classmates and I were walking back from dinner when a women ran by us down the sidewalk. Close behind her, a man leaped upon her, yanked her backward by the hair and started hitting her in the face. All three of us exchanged a look, wide-eyed and frozen; terrified to something and terrified to not. The couple continued to scuffle. The woman would hit back and he would subdue her and deliver a punishing blow until she’d stride away again and he’d follow her. The cycle continued for what seemed like an eternity, though it couldn’t have been more than a few minutes. People walking nearby didn’t even stop to look. My classmate approached a man, dressed professionally and likely walking home from work. The man ignored my friend’s pleas to help and waved him away. We next approached a couple and were told not to do anything and that getting involved would only make matters worse. In all likelihood, the woman would end up defending her man and somehow place the blame on us, we were told. “This is the way things are here.” Eventually, we persuaded them to call the police, but the only good it did was make us feel like we did something progressive about the situation. The experience was sobering but also eye opening. Behind the monuments and icons of women’s empowerment, there’s a dark face of the women’s movement; one that I hope to bring to light through my photos and article.